Two announced Rockstar Games efforts, Max Payne 3 and Agent, were nowhere to be seen on publisher Take-Two's most recent release list. So where are these games, one of which was announced as a PlayStation 3 exclusive almost two years ago? They're still in development, according to Take-Two Interactive chairman Strauss Zelnick who offered the following detail on the publisher's quarterly earning call today. Rockstar&apos;s Agent "Still In Development"
Mr. Zelnick offered no further details or confirmation that "in development" means "actually coming out at some point in the far-flung future," but it's at least a shred of hope that Agent, Rockstar North's planned Cold War-era espionage game, still exists in some form. In some form that's not just a logo, I mean. 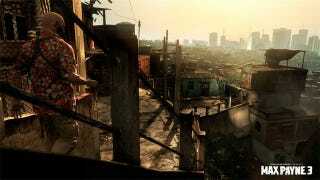 Max Payne 3 we have more hope for, in terms of seeing anytime soon. Last December, Rockstar told Kotaku that the team was "still working hard" on the third Max Payne game. Rockstar updated us as recently as April with fresh Max Payne details and screen shots. With E3 2011 just around the corner and console makers looking to make a splash, we wouldn't be too surprised to see new signs of life from one or both soon.